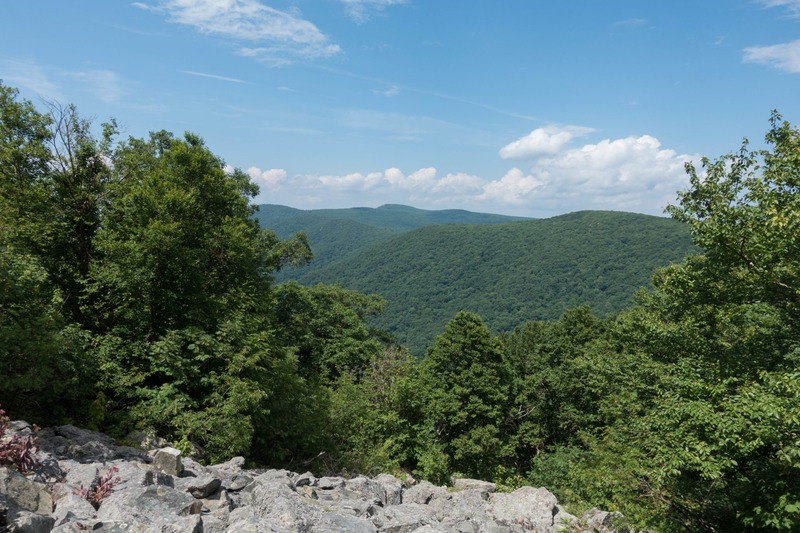 We’ve explored Shenandoah quite a bit, but there are many hikes we haven’t made it to. The southern district springs to mind, as we usually frequent the closer north and central districts. 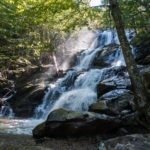 There are hikes that we haven’t done that are (according to popular opinion) some of the best the park has to offer. 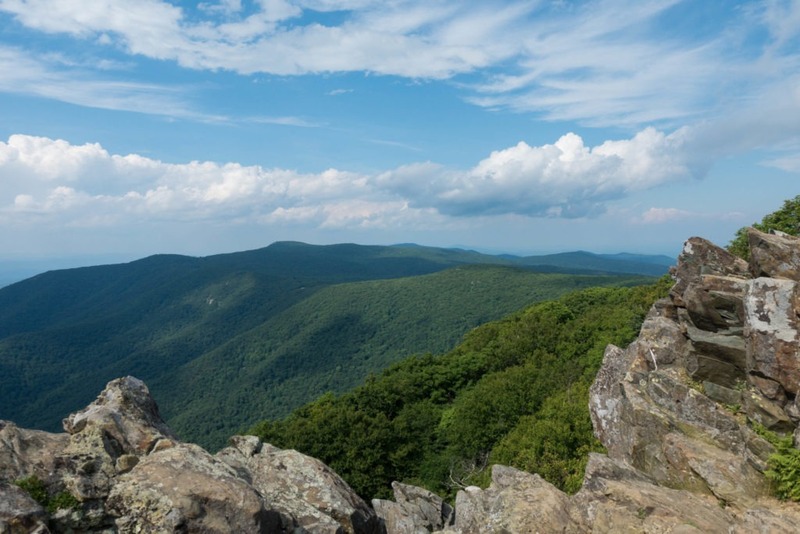 If you search for best hikes in Shenandoah, Hawksbill is usually on the list. So, we traded in a humid summer day in DC for cooler and slightly breezy weather. It’s always invigorating leaving DC and entering Shenandoah. Somehow the mountains simultaneously relax and energize me, and make me want to live closer to the park. Hasn’t happened yet though. 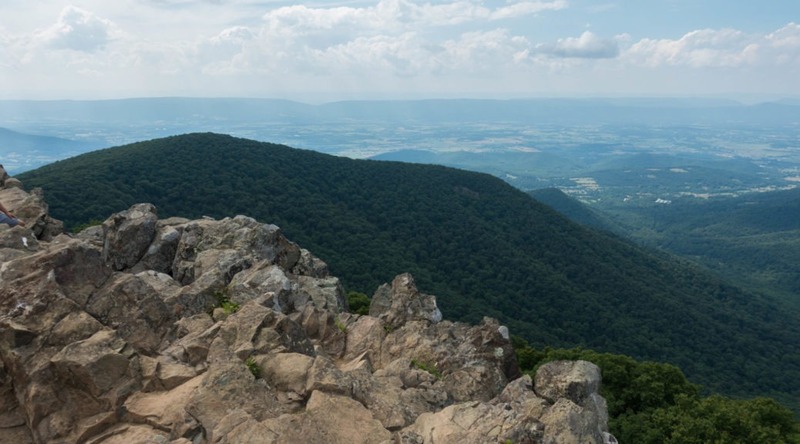 At 4,051 feet, the Hawksbill summit is the highest point in Shenandoah National Park. That’s reason enough to hike to it. As with most points in the park, there are multiple ways to get to the summit. We chose to do a 2.9 mile loop, recommended by the park website. Our first challenge was finding parking for this popular hike. We pulled over at the Hawksbill Gap lot at mile 45.5, where the Lower Hawksbill Trail starts. 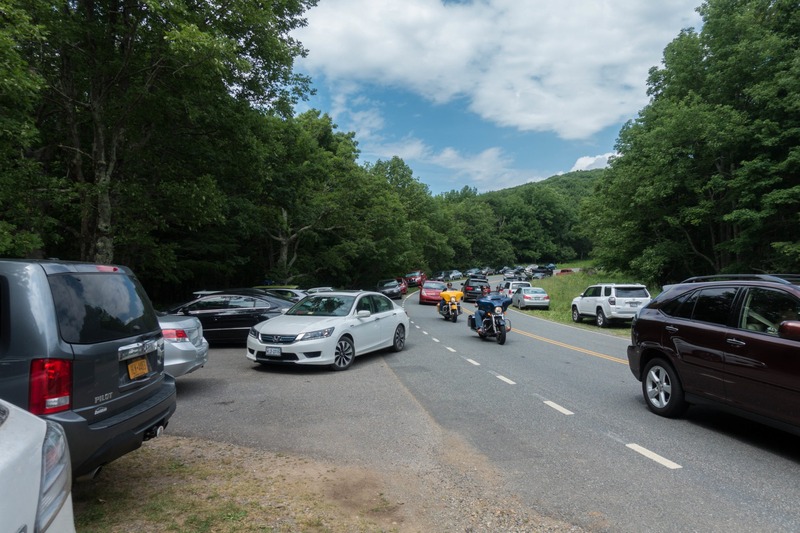 There are parking lots on both sides of the road, but many visitors make their own parking spot in the grass. The abundance of people worried us, as we prefer solitude on hikes. Trails diverge to the left and right of the trailhead. The left trail is Lower Hawksbill, our return route. 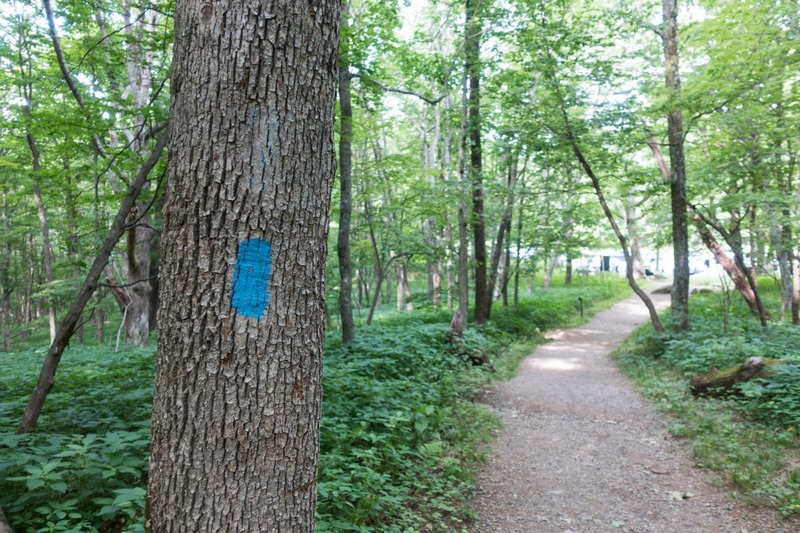 The trail on the right is a small spur leading to the Appalachian Trail. We grabbed our gear and headed down the spur trail. Once we reached the AT, we greeted some thru hikers. It’s always great to see thru hikers (and less great to smell them), and it reminds us that we’d love to do a thru hike some day. We turned left onto the AT, and started a slow ascent. 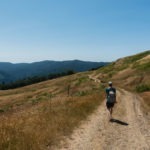 It was pretty easy going – in fact, most of this trail was easy, despite the fact that it leads to the highest point in the park. Soon the trail reached one of our favorite features: Talus Fields. 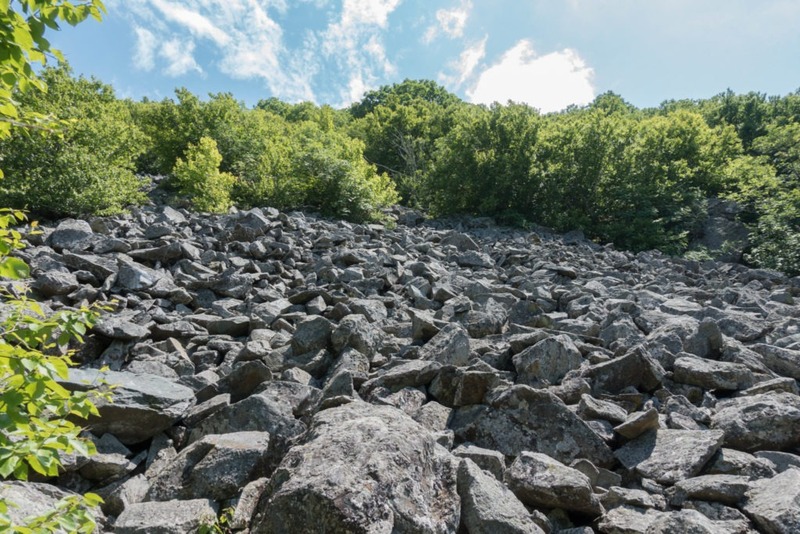 There are three talus slopes (also called boulder fields) that feature rocks covering the hillside. All the fields come in succession, with only a bit of forest in between. We stopped and admired them, and thought of the effort it probably was to create a trail going through the boulder field. We wondered what natural processes had created these features. This is a talus field: a large rocky hillside – pretty cool! After about 1.1 miles, we came to a fork in the trail. Here, we said goodbye to the AT as we turned onto Salamander Trail. 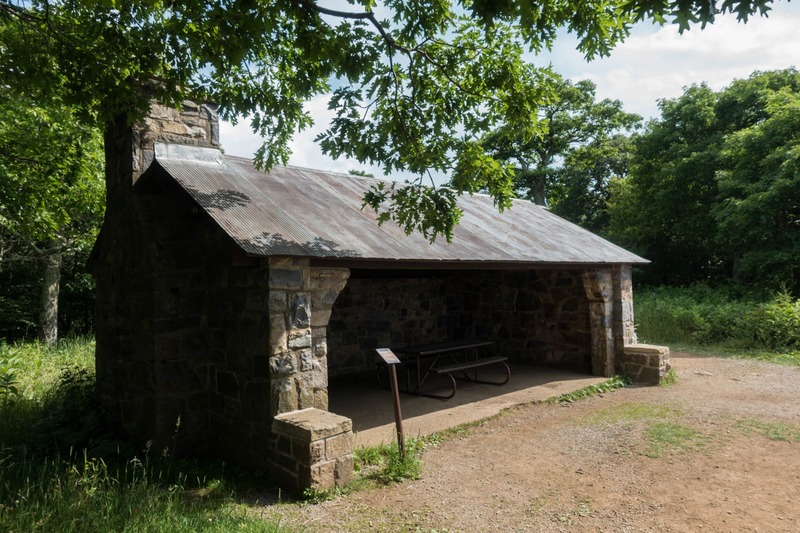 Appropriately, the trail’s namesake is the endangered Shenandoah Salamander, which only exists inside of Shenandoah National Park. Really cool, and slightly sad at the same time. The higher elevation area of Hawksbill is one spot that provides a cool, moist habitat for these amphibians. As we hiked on the trail, we saw various salamander testing “stations.” We wondered how the park service was conducting their research. I scanned the trail for salamanders as we hiked, but didn’t manage to find any. This brought back great childhood memories of finding salamanders in the Great Smokey Mountains with my dad. We’d explore creeks and flip over rocks to find them, admire them, and then let them on their way. There were two numbers to call on a tag on the stations, and I called both. The first number was out of service. The second went to the voicemail of a contractor lab for the USGS. I was hoping for some sort of prerecorded message to give me more information. So…I’m assuming the machines test air quality and other environmental statistics. 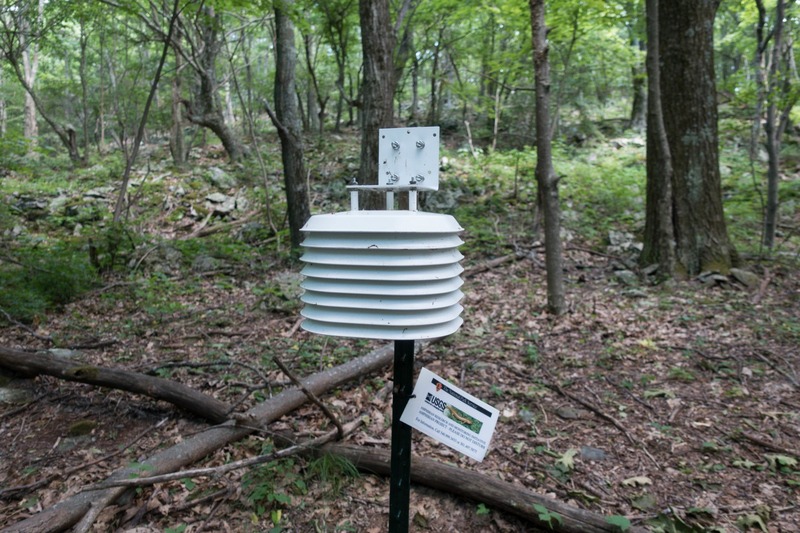 The Salamander Research Station… how does it work? The Salamander Trail also provided our first glimpses of the views that awaited us at the summit. There are a couple breaks in the treeline where giant rocks congregate. 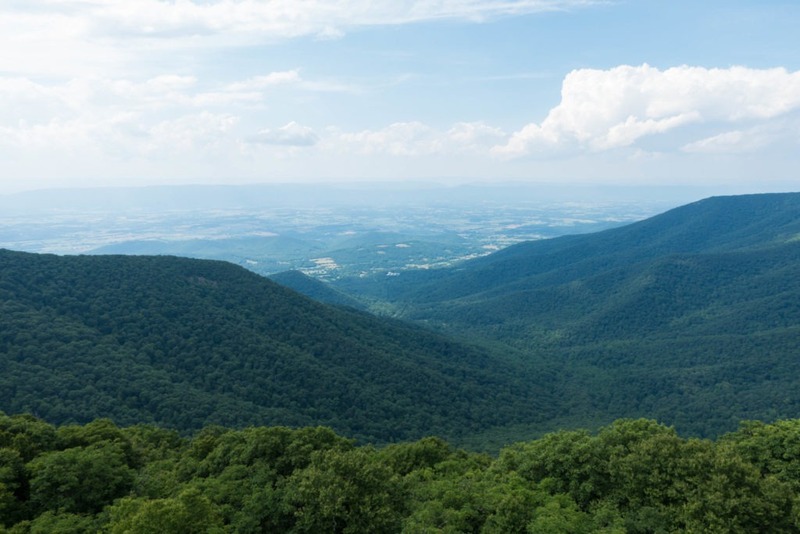 We went out and appreciated the views of the Shenandoah Valley, but knew that the summit must be even better. Without fanfare, the trail ended and dumped us onto the Byrds Nest 2 Fire Road. In only a few hundred feet, we saw the Byrds Nest 2 Shelter, which meant we were close to the summit. 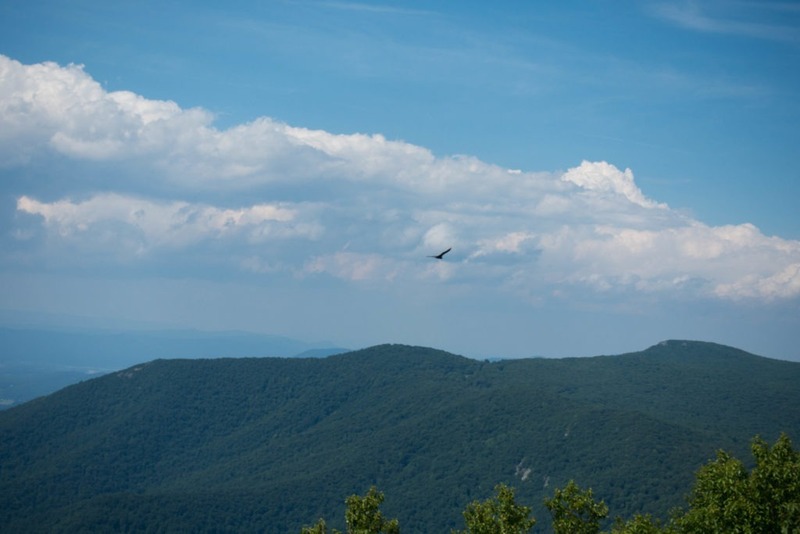 And the top of Shenandoah awaited us a few hundred feet beyond. We saw this bird along the trail… maybe a hawk? Probably a Turkey Vulture. Byrd’s Nest #2 Shelter – just a picnic table, not for camping. 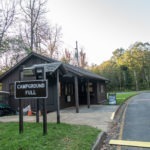 Camping is actually prohibited on sections of this trail. At this point, our solitude abruptly came to an end. Other hikers dotted the summit. We knew all the traffic we’d seen at the parking lot would catch up to us eventually. 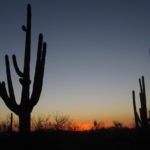 Expect it to be crowded in the summer and on the weekend, especially for a relatively easy hike with big payoff. But the summit provides an extensive view of forest, mountains, and nearby towns – and the view was relatively clear that day. 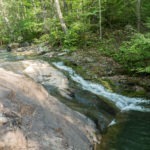 It’s evident why this is considered one of the best hikes in Shenandoah. 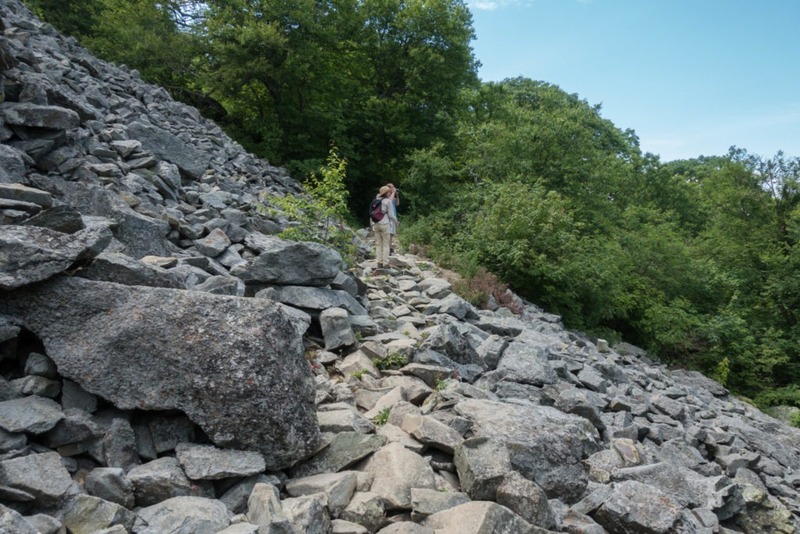 We scrambled around the rocks at the top, and a man-made platform, taking in the view. Getting photos without people in them required some patience. Was it worth the throngs of people? And the small biting insects at the top (they were terrible)? We thought so. But it probably won’t be a hike that we repeat often. This manmade viewpoint at the summit seemed out of place. The platform did have an interesting compass. After getting our fill, we grabbed a snack while fighting off pesky insects, and then headed back on the Lower Hawksbill Trail. This is the trail that the majority of people take, so it was much more crowded than our ascent on the AT. We ran into quite a few people who aren’t regular hikers, so be patient. 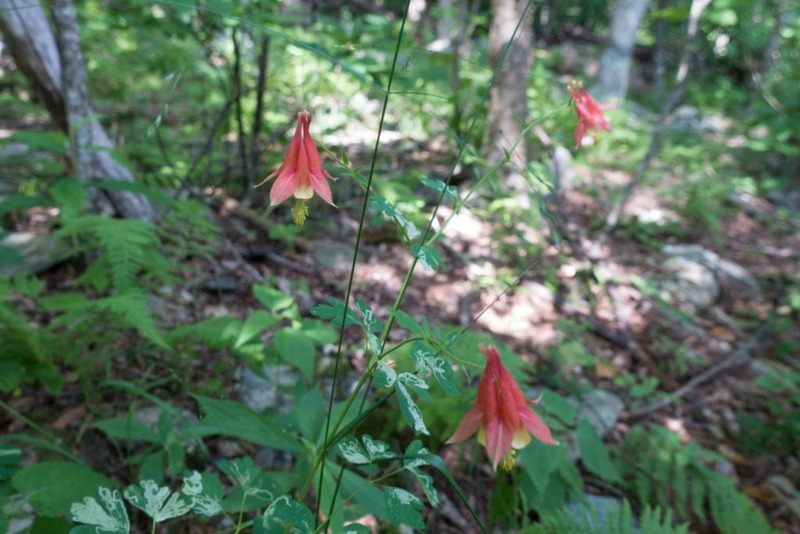 Otherwise, the trail itself was nothing special, beyond some columbine we found on the way down. After a quick mile, we were back at the trailhead. 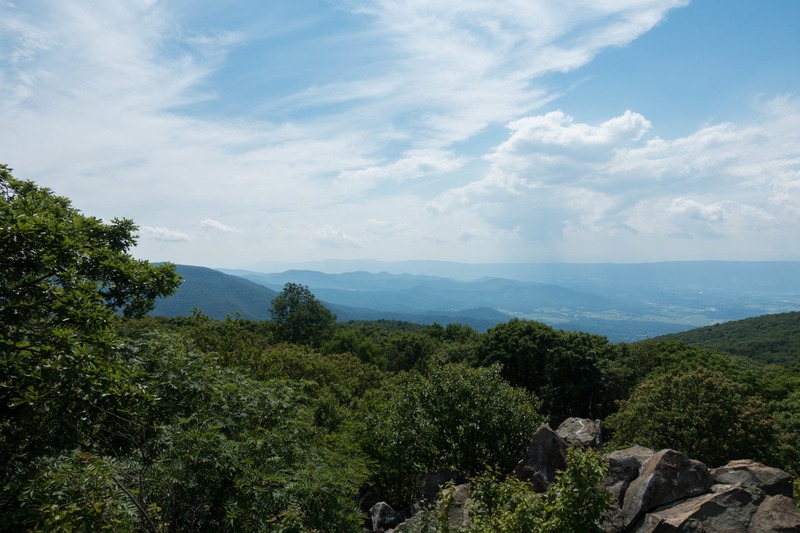 Back in the parking lot, we hopped in our car, and headed back home via Skyline Drive. 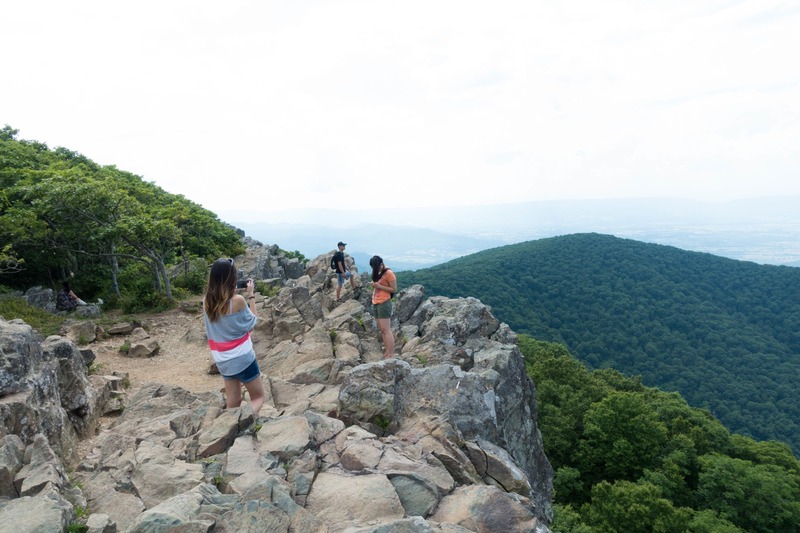 The hike is definitely a must-see in Shenandoah – mainly because of the views provided by the highest point in the park. The talus fields are a nice bonus. We just wish it wasn’t so crowded. It is a hike that’s probably better to do during the week, or during the off season. I bet winter would be a great time to go. But hiking it once was good enough for us, at least for the moment. There are other hikes in the park that we prefer. 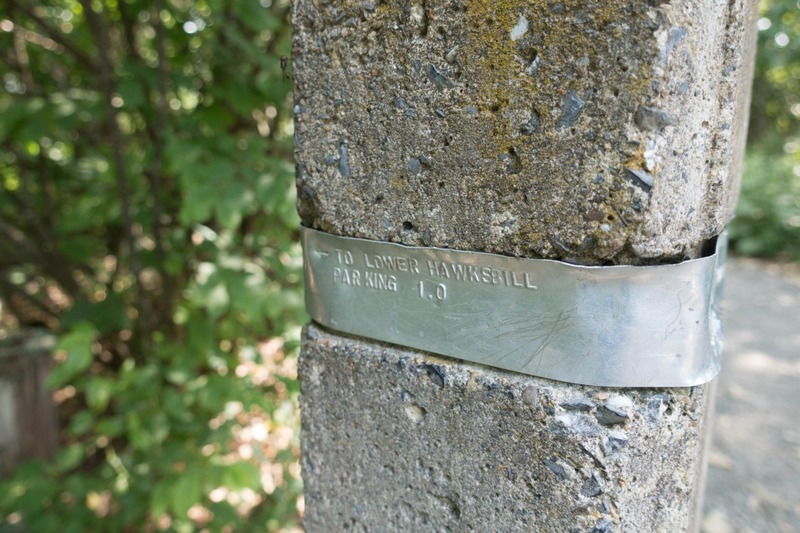 The trail marker says 1 mile downhill to the parking lot. Though it’s only .8 miles according to the map. Easy. 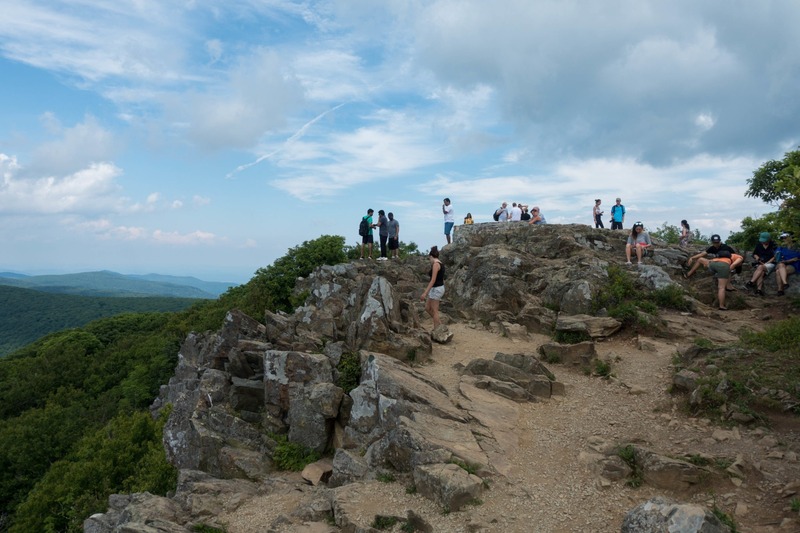 Crowds: A ton at the top, and on the descent, but not a lot on the AT or Salamander Trail. 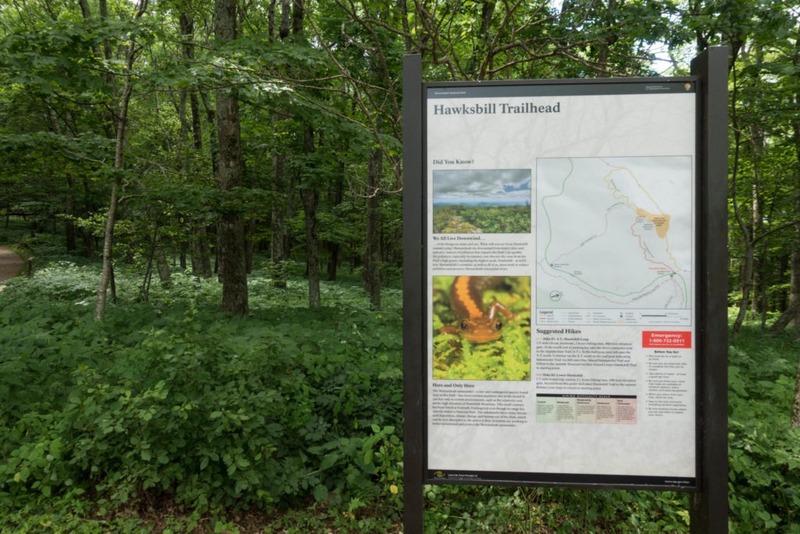 Mile 0.0 – From the Hawksbill Gap Parking Lot, head to the trailhead sign. Trails go both left and right here. 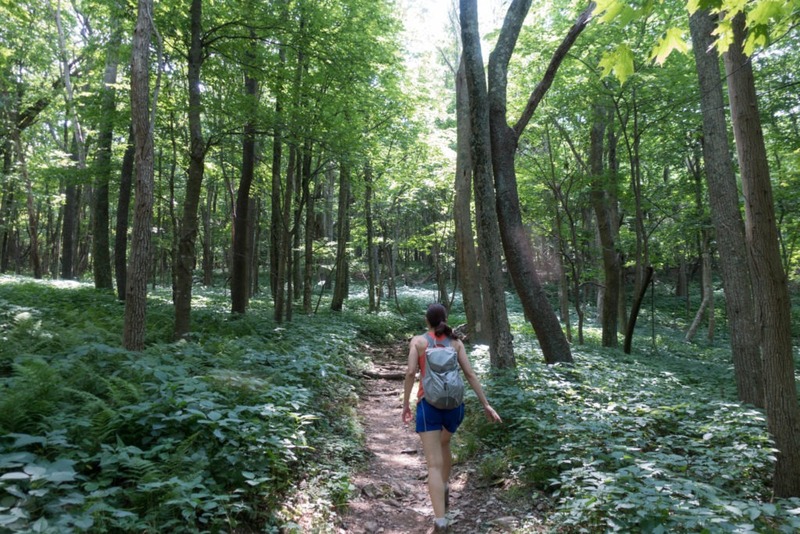 Take the right path toward the Appalachian Trail. The short spur ends at the AT. Head left (south) on the AT, following the white blazes. Mile 0.4 – At this point, you’ll meet the first of three talus slopes along the AT. The other two are in short succession. Mile 1.1 – The trail splits here. Take the left trail to the Salamander trail. Wave bye to the AT! The salamander trail winds its way up the mountain, with a few views along the way. Mile 1.9 – Reach a gravel fire road known as Byrds Nest 2 Road. Turn left; it’s a short distance to the summit. 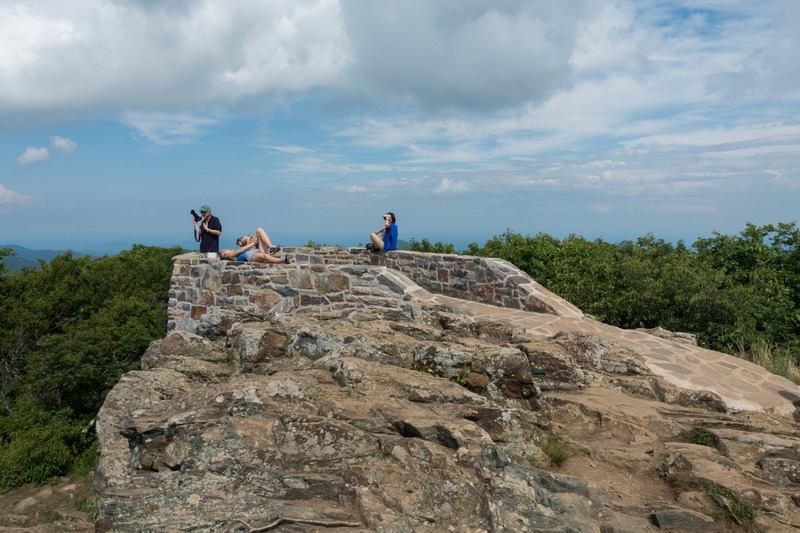 Mile 2.0 – The summit of Hawksbill Mountain! Breathe it in. On a clear day, you’ll get a great view. When ready, turn around and go back down the fire road. 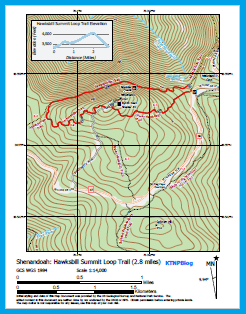 Mile 2.1 – Turn left onto the Lower Hawksbill Trail, which will take you back down the mountain. Mile 2.8 – Back at the parking lot.